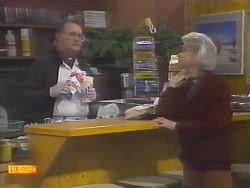 Jane and Henry standing outside Joe Mangel's house, waiting for him to answer the door. MAN: What do ya want? 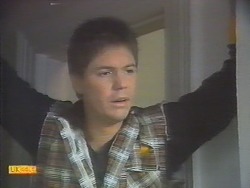 JANE: You're Joe Mangel, aren't you? MAN: Whatever you're sellin', I'm not buying. MAN: I'm not in the market for religion, either. Buzz off. JANE: I'm your niece! Jane Harris. JOE: Yeah? Yeah... last time I saw you, you were knee high to a grasshopper. Yeah, you're like your mum. Jane, eh? JOE: You're my niece. So what? JANE: I want to talk to you. It's about the family. 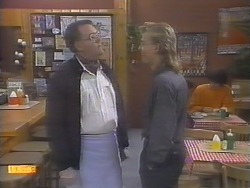 JOE: Look, as far as I'm concerned I haven't *got* a family, love, so we got nothin' to talk about. Ping off, both of ya. With that, Joe slams the door shut. Henry murmurs to Jane that they tried. Jane, however, grits her teeth and retorts that Joe's not going to get away with it. She starts hammering on the door. HELEN: Paul, it probably isn't the time to offer you some home truths, but I'm going to anyway. PAUL (mutters): Gran, I have not got *time* for this. HELEN (ignoring the protestation): At best, you are going to start making bad decisions – and hurting a few relationships to boot. At worst, you could be heading for a breakdown. PAUL: Look, work *has* to get done. PAUL: Yeah... Rosemary. That pastoral development investigation: she wants it completed – yesterday, if possible. He throws the fax up in the air and leans back in his chair, looking frustrated. HAROLD (tersely): Oh, right, yes, innocently enough said, but there lies the problem, doesn't it? HAROLD: You, a budding journalist, would say that? I'm disappointed! SCOTT: The first Erinsborough Scouting troop founded in 1952 by H.J. Powley! SCOTT: I really miss her, Harold. HAROLD: Oh, cheer up – I'm sure your transfer will come through. You *did* get a hopeful reply to one of your applications, didn't you? 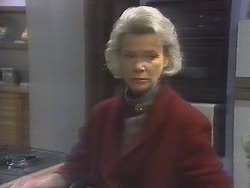 HAROLD: You know, I think having the Davies girl staying with her might be proving to be too much. JANE: I think it's pretty pathetic for a grown man to be sulking inside his house because he's too gutless to speak to a member of his own family. JOE: I've had you. I've had *both* of you. JANE: Don't you even want to know about your mother? Your *own mother*. Haven't you got any feelings at all? She had a heart attack three months ago. JOE: Oh *did* she? Well, she's of an age when that sort of thing can happen, isn't she. JANE: Is that all you can say? JOE: I'm not a hypocrite. I haven't seen her in a dozen flamin' years and a dozen more will suit me fine. Is that why you came here, is it? To take the long- lost son back to the grieving mother? How well do you think you know her? JANE: I *live* with her. JOE: Yeah, well, you know her all right – unless you're stupid. Look, twelve years ago she expected the worst in me; she went looking for it and she found it. You're not doing the old dragon any favours looking for *me*. JANE: There's a gun in the house! JANE: She tried to hide it when granddad left. She's terrified of it; she won't talk about it. It's *your* gun, isn't it, Uncle Joe? Joe stands there staring at Jane. NICK: You having a shot? SCOTT: When you write a letter to Santa Claus, why don't you ask him for a sense of humour?! JOE: Should go with him – cabs cost money. JANE: It's only family now. I'll go when I learn the truth. JOE (mutters): She had the right idea: put the gun back in the hole and bury it. JANE: Whatever you did... whatever happened between you two, can't you just bury that as well? JANE: You know, I never had much respect for my mother, but when nan had a heart attack, she came. She came all the way from Hong Kong. JOE: When you wave the word 'family' around, I reckon it should *mean* something. *We* don't *qualify*. Don't get me wrong – I've got nothin' against your mother. We were different: she was always after her best chances; good luck to her, I got no grudges *there*. JANE: But you're not going to tell me about the gun? JANE: I want you to come and see nan. Come on – won't you even *think* about it? JOE: Look, the last time I saw you, you were just a little kid. Considering the odds, you turned out all right. With that, he starts the ute's engine and drives off, leaving Jane standing in the road watching him go. NICK: Hey, Todd, why don't you grab a seat? TODD (bitterly): Why don't you drop dead? HAROLD: You know, I had my doubts about that boy, but the more I know him, the more I'm impressed. PAUL: You bet you will. 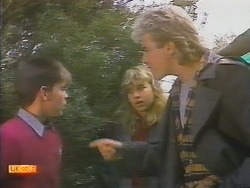 PAUL: Listen, Jane, you know we're swamped at the moment; you know I'm counting on you. If you want to pick and choose your working hours, you find a boss that can afford it. JANE: I *said* I was sorry. PAUL: Afternoon tea, is it? He then tells Henry that Jane has got work to do. Henry backs off and heads out. Paul glares at Jane before returning to the office. TODD: Hey – who's got my game? NICK (holding up the game): You mean *this*? TODD (coldly): So you're a thief as *well*? EMMA (snaps): Todd, you take that back. You said I could borrow it any time I *wanted* to. NICK (in a mocking voice): That was before...! NICK: Why don't you go and watch television? Sesame Street should be on about now! TODD: What – you gonna make me? EMMA (sighs): Oh stop it, both of you. NICK (to Todd): You call me a thief, I ought to spread your face. TODD (retorts): Oh try it, bigmouth. NICK (snaps): If you weren't such a little runt, I'd *do* it. NICK: Do you want a paper bag so you can fight your way out of *that*?! EMMA: I think it was *my* fault. HELEN: Do you want to give me *your* version of it? SCOTT: Keeping up a great tradition: certainly been a lot of skin lost in *this* backyard, huh?! HELEN: Hmm... you *and* Paul – and even Julie on occasions! Don't remind me – talk about déjà vu! SCOTT: Gran, you're taking it too seriously! HELEN: Am I? Thanks to you and Paul, I've been educated into how stupidly boys behave when they become involved with girls...! SCOTT (looking surprised): *Emma*? I thought Nick would be too *old* for her. PAUL: Jane, I am trying to apologise. JANE: I know – and for a start, I was in the wrong, so there's no need; and secondly, I *would* rather get this done – I'd feel a lot better. PAUL: Jane, Rosemary has been *swamping* me with work lately. She can wait: those invoices are a priority. JANE: I did *see* him again – my Uncle Joe – and I *would* like to get to know him better, but I don't think that can happen: you see, he hates the rest of my family. HENRY: Perry White doesn't want Clark Kent, eh? SCOTT (sighs): Six months before there's a position vacant as a cadet. SCOTT (sighs): On the Erinborough News, what do I get? Flower shows! On a city paper, I get to cover big stuff, you know? HELEN: You know, I don't believe you'd let him take the blame if it wasn't his fault. TODD: He borrowed my game and I did my block. I threw the first punch. TODD (shrugs): It's a free country. HELEN: So it is. Todd, if you have any more objections to Nick staying here, I want to hear them – *now*. TODD: It's not just Emma. Well, he sprays garbage all over the fence outside the workshop and what's he get? Superstar treatment. I know what would happen if it were *me*. HELEN: Look, I know this may sound boring, but we're trying to help someone who's having a tougher time than *we* are, so I'd appreciate a little more tolerance while he's here, thank you. TODD: Yeah, whatever you say. What about today? HELEN: That's up to Jim – but I think you'd have a better case if your homework's done. HELEN: Where did you find this? TODD: On the coffee table. HELEN: That's where I put it when I came home, so what have I done with my purse? TODD: Well, you couldn't have *lost* it: your handbag was closed. Looking suddenly worried, Helen asks Todd to go and look out the front and see if she's dropped it out there. As Todd heads out, he reminds Helen that Nick *was* standing right next to her in the Coffee Shop when she paid Harold for the lamingtons. Helen stands there looking worried.